"The EC750E HR is based on our popular EC750E crawler excavator but has been substantially re-engineered for high-reach deconstruction purposes with a heavier and wider undercarriage and factory-fitted guarding," said Walter Reeves, sales manager for demolition products at Volvo Construction Equipment. "The EC750E HR is based on our popular EC750E crawler excavator but has been substantially re-engineered for high-reach deconstruction purposes with a heavier and wider undercarriage and factory-fitted guarding," said Walter Reeves, sales manager for demolition products at Volvo Construction Equipment. 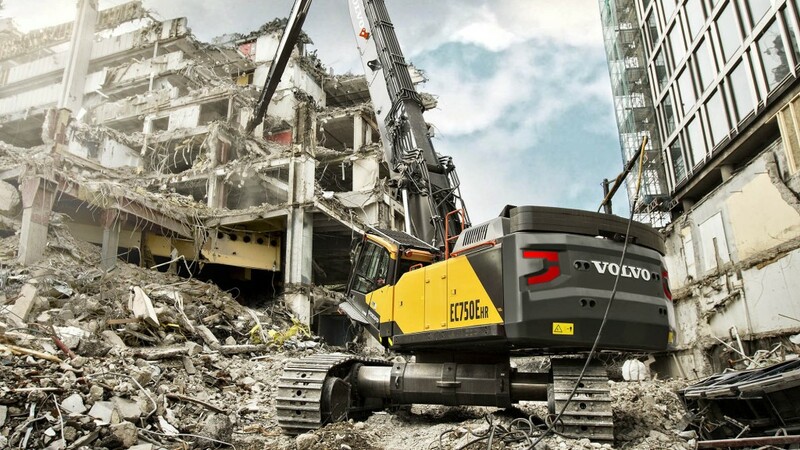 "The features on this machine give it the power, stability and versatility contractors need to tackle some of the most challenging, large-scale demolition projects." Volvo's patented hydraulic modular joint concept uses a two-pin hydraulic lock mechanism to allow the high reach to be changed into a digging configuration with only one person in less than an hour. The retractable undercarriage features easy-to-remove track frames and the ability to self-disassemble and reassemble, which makes transporting the EC750E HR an easy process. Support you can count on Like all Volvo excavators, the EC750E HR is backed by the Volvo Lifetime Frame and Structure Warranty, which covers the frame, boom and arm for the entirety of the initial period of ownership. It is also eligible for ActiveCare Direct™, the Volvo service that provides 24/7/365 active machine monitoring and fleet utilization reporting directly from Volvo.